Splash pages, you gotta love 'em. A blank canvas where the artist can hit you with a large dose of illustrated 'wow'. This week, a look back at one of a DC relaunch done good, with a splash of Sinestro by Ethan Van Sciver, plucked right from the pages of Green Lantern: Rebirth. For me the former GL turned leader of the fear-fuelled corps, recently turned GL again has been the most interesting charcater of the GL franchise since the Sinestro Corps War storyline. Here Ethan proved he is the best modern artist to bring his markers to bare on the villain, heralding Sinestro's rise to Magneto level cool. While the clicked and enlarged version makes for a wicked wallpaper, writer Geoff Johns now just needs to connect the yellow light of 'fear' and the yellow glow of the 'positive' speed force and we'll be right. This is an awesome splash page w/Sinestro. 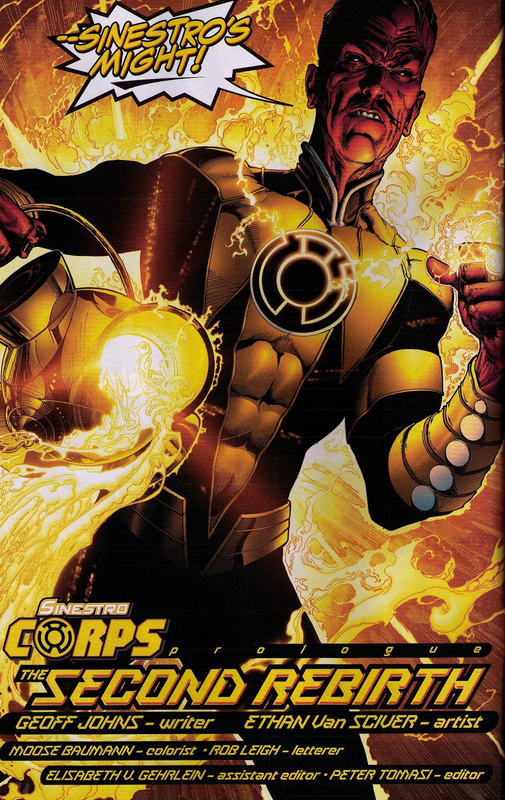 I'm kind of on the fence about Sinestro being a GL again, especially after all the deaths he's caused over the years, still I'll see how this all unfolds. Although it is cool see him fight his own corps though! Also, as a side bit of shameless plugging, I took a slight page out your playbook and show a forgotten character in yesterday's blog post. Check it out if you already haven't and let me know what you think. Have a good weekend Dan. It definitely wasn't a twist I saw coming either Dale - but that's what I've liked about the GL-Verse since Ivan Reis come aboard. It's just been one unseen direction after the other. Here's hoping a few years later we are saying the same about Aquaman! Will do too mr - this week has been all about packing, but I'll be back and mouthing off on your blog again now all the hardwork's done! Hope you had a good one!